Lately, I've been going through my summer wardrobe trying to see what I can make work for me this year. Most of these clothes haven't been worn for two years; my daughter was born last summer, so of course I was not in 90% of my regular summer clothes after her birth. And, of course, my body is just not the same post-baby, so there's that. But I'm trying really hard to be frugal and not spend a gazillion dollars on a new wardrobe, so I've been looking for ways to make my existing wardrobe work. The first project I took on was a simple one. I had this pretty black top that I like, but it's always been just a tad on the short side, so I never wore it. Last fall I showed you how to lengthen a knit shirt by adding a band in the middle, but that technique wouldn't work here. It wouldn't look right with the shirt, and this shirt is not made of knit fabric, so I knew I would need a different approach. Finally, it occurred to me that some black lace would go well with the top and give it the extra length I desired. I bought a yard and a half of black lace trim that's about 3 1/2" wide. It was so simple to add to the shirt! I started by pinning the lace to the bottom of the shirt; the right side of the lace was against the wrong side of the hem. I lined up the end of the lace with the side seam of the shirt. Next, I just top-stitched the lace in place, sewing on top of the shirt's original hem. When I got back around to where I started, I simply folded the edge of the lace under a little bit and stitched it down. You can see in the picture below it looks like a little seam. That was it! My new shirt was ready to wear. Excuse the fact that I obviously had my cell phone in my pocket when this picture was taken, lol! I am happy with the way this turned out, though. It looks pretty and fits with the original design of the shirt, but those extra few inches of lace help me feel more comfortable and less like I need to tug down on the shirt constantly. Stay tuned for upcoming projects on giving your wardrobe a makeover! Linking up with the Weekend Retreat, Inspiration Spotlight, Teach Me Tuesday, Treasure Box Tuesday, Take-a-Look Tuesday, the Saturday Sharefest, and the Sunday Link-Up. Loved this project!!! And, it's something that I can actually do. Your shirt turned out beautifully. Thanks, I was really pleased with it! Yes, it's something that people of pretty much any level of sewing skill can do. Our mission is to make the most with what you got. You sure did that!! Great job! Yes, indeed--you have to stretch those pennies any way possible! That came out really good! Simple too. Thanks! Don't you love it when simple projects turn out nicely? Very cute idea! I always hate when my shirts are too short. What a great solution! I can't stand it when my shirts are too short, either, and I'm taller than average, so it's a common problem for me. I like that this solution actually looks nice. I really like lace, too, of all different kinds. It's just so pretty and feminine. Me too! It sure saves a lot of money. This is such a good idea! I do this with skirts all the time! Lengthening skirts with lace would be so cute! That's pretty clever! I love the way it turned out. Great job! Thanks, Sabrina! The best part is how easy it was. How clever! I need to use my sewing machine more.. 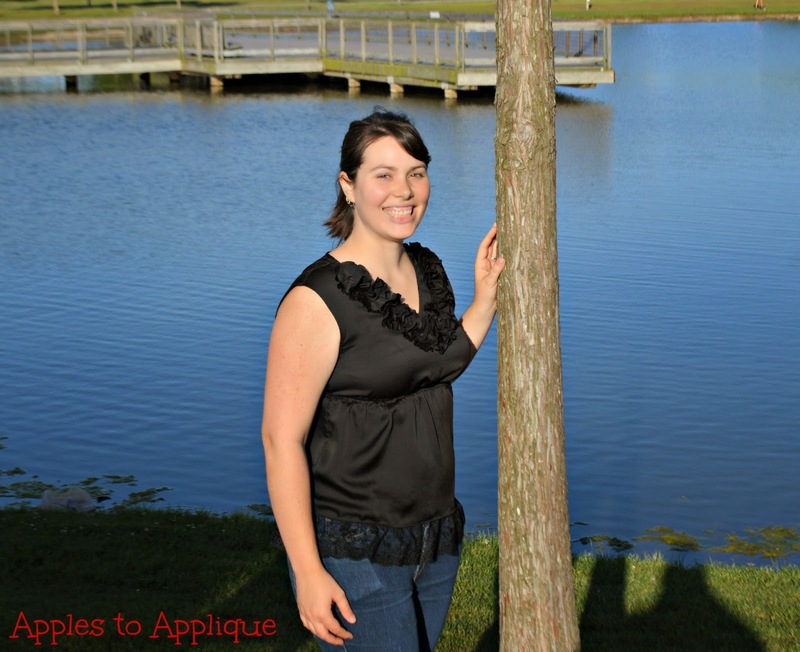 Thanks for the invitation to your link party; I've gone by and linked up! Why do they make shirts so short these days??? Argh!! 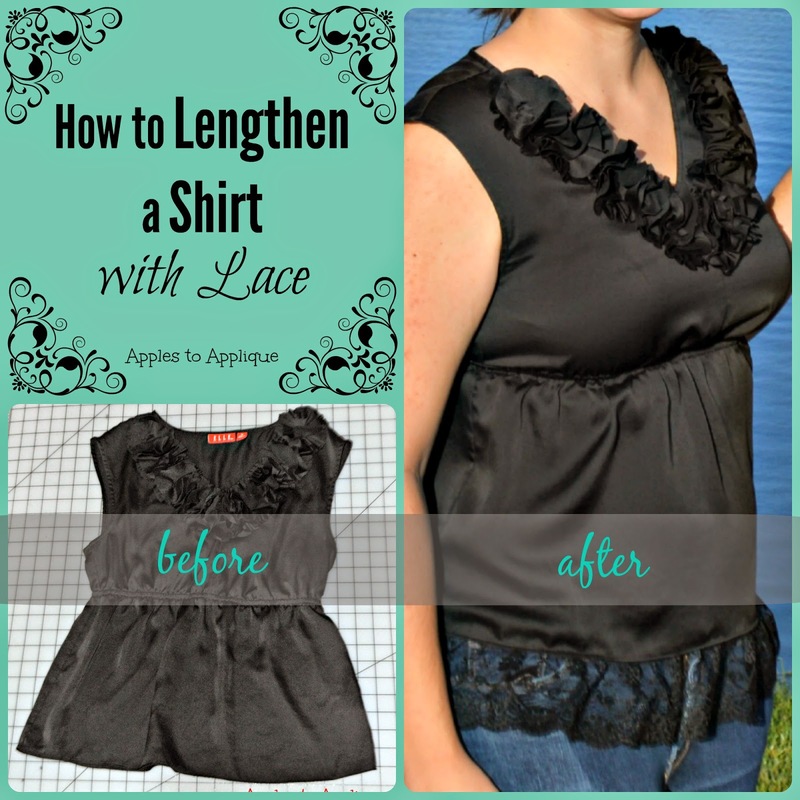 I need to add lace to at least a couple of shirts in my closet! Thanks for the tips! I don't know, but it's a pet peeve of mine! I love tunics for that reason, but they're always going in and out of fashion so they're not always easy to find. At least this gives me an option for some other shirts. I'm with Jennifer. Shirts are way too short for my body. Love the easy solution for adding length. I can already see three in my closet that this would be perfect for. No more lumpy layering! Thanks for linking up with us today at Kansas Women Bloggers! Layering can be great, but I agree it is often lumpy--and too hot for summer! I hadn't thought about doing this to extend the wardrobe of growing girls--great idea! Thanks for sharing!